The next superintendent of the Boston Public Schools has come down to four finalists. On paper, all seem to be technically capable of doing the job of managing a school district. However, a large and complex urban public school system like Boston does not need a superintendent who is a manager — Boston needs a superintendent who is an innovative leader with a diverse educational background, and who has a clear vision for closing the achievement gap and improving the college and career success of its graduates. The next superintendent needs to be a fearless change agent who is uncomfortable with the status quo and willing to hire smart administrative and instructional leaders who exhibit an urgency to push for all students to be academically and globally competitive. Boston Public School students are overwhelmingly in low-income families, requiring a different approach for achieving successful outcomes. Over the past 25 years, the understanding of what it takes to close the achievement gap and increase student success has evolved. Graduating from high school is simply not enough. Students from Boston must be equipped with the skills to be accepted into and graduate from competitive post-secondary opportunities and then be launched towards a successful career path with a competitive salary. We know from nearly two decades of charter and turnaround school innovations that autonomous schools with excellent leaders create teams of educators who achieve proficiency goals in their schools comparable to high performing suburban districts. Examples of these best practices include strong teacher development, a culture of high expectations, extending the learning day, and building collaborative partnerships with community organizations. Recently, a study from The New Teacher Project has shown that hiring new teachers by May, creating a culture with high expectations, consistent expectation and consequences for student behavior, a focus on teacher development, observation and feedback, and excellence in evaluation and appropriate responses to good and poor teacher performance will dramatically increase student achievement. Additionally, we have also observed that connecting schools to high-performing after school programs, and holding the principal of the school accountable for how the after school program partners with and shares practices with the school can enhance student achievement. And we must make sure that every child who needs K-1 has access to a seat. If there is one large urban system in America which should be the first to solve the achievement gap, it should be Boston. Boston has already made great strides toward bridging what had seemed intractable: the achievement gap and college or career success. We must push beyond the achievement gap towards excellence. Under John McDonough’s leadership, a number of the above lessons have been implemented in the district schools. The next superintendent must build upon and accelerate these important changes, creating intolerance for low expectations, underperforming teachers and principals, fixing the disaster that has been vocational education in Boston, working with the successful nonprofits that have figured out what students need to be successful in college, and be unafraid to tackle the issues which have hamstrung the district. In a city with innovative thinkers and problem solvers, we need to go beyond proficiency and strive for excellence. 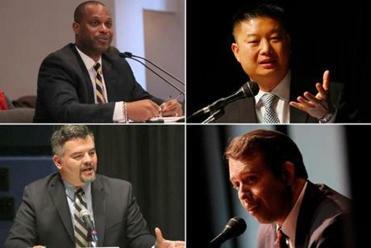 After a week of interviews with the School Committee, Boston has four finalists for superintendent. Juma Crawford, Harriet Lewis, and Bill Walczak are leaders of the Lewis Family Foundation, which funds educational innovation in Boston.